With its 26 inch wheels, the Frog 69 is a perfect fit for youngsters from around 10-12 years old. The Frog 69 is built on a small frame that takes adult size 26 inch wheels. Everything else being equal, 26 inch-wheels are faster than smaller wheels and they are more capable of rolling over obstacles. 26 inch wheels can also be more convenient. If fellow family members ride 26 inch wheel mountain bikes or hybrids, you can share the same spare tubes and so on when you go out together. Frog bikes, like most better-quality adult bicycles, are built on aluminium frames with (mostly) aluminium parts to keep their weight to a minimum. What makes Frog really stand out is that their forks, hubs, bars, stems, seatposts, V-brakes & levers are all alloy too. This makes a Frog bike kilos lighter than most of their competitors' equivalent sized kids' bikes. Another original detail is that the Frog 69 comes with lightweight alloy quick release wheels fitted with good quality Kenda 26 x 1.5 inch hybrid tyres which will be easier rolling than the 26 x 2 inch knobbly mountain bike tyres you'll find on most of their competitors' bikes. Skinnier tyres make a Frog bike easier to accelerate and hence more fun to ride much of the time. If you're worried that your child might quickly outgrow this bike too quickly, Frog offer an alternative 26 inch wheeler with a bigger frame - the Frog 73. Technical attributes aside, this is no ugly frog. 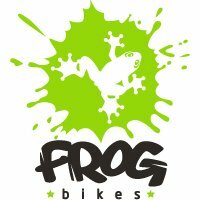 Frog bikes look good, so your child should be really proud to own one. To help ensure the bike delights, Frog bicycles are available in a choice of colours. Frog's passion for making better bikes for kids shines through in this video. Lightweight aluminium alloy frame (14 inch seat tube) and fork. Easy to use high quality Shimano Alivio Rapidfire Plus 8-speed gear shifter and Altus rear derailleur. While their competitors make do with entry level Shimano Tourney gearing, Frog hybrid bikes come with mid-range Shimano Alivio/Altus, frequently spec'd on £500-£600 adult bikes. The alloy cranks are a child-friendly short (140mm) length with 36t chainring. The sealed bottom bracket ensures these cranks spin freely. The 520mm alloy handlebar is fitted with narrow grips for smaller hands. This bars are fitted to a short 40mm alloy stem to keep them within easy reach. Tektro alloy V-brakes with alloy levers are a common sight on good quality £300-£400 adult bikes. Being a British company, Frog know to supply their bikes with front and rear mudguards. The saddle is fitted to a full-length 300mm long x 27.2mm diameter seatpost to ensure this bike 'grows' with the young rider. The QR (quick release) seat binder facilitates easy seat adjustment. Minimum recommended inside leg measurement to the floor: 69cm. Approximate age range: from 10/12 years old. Frog is a British bicycle company with a mission - to create the best kids’ bikes they can. The couple who created Frog bikes are parents of young cyclists themselves. Being cycling enthusiasts, they know that if a bike is to delight, a good place to start is to make sure it’s as light as possible and that it fits properly. This is even more true for children than it is for adults. Growing kids are going to have problems if asked to pedal and manoeuvre bikes that are more than half their weight (sadly this happens). That’s why we are proud to introduce a company that is committed to one goal - making cycling a pleasure from the start. The Frog range covers every children’s age group from toddlers to youth. Tyres Kenda 26" x 1.5" hybrid tyres. This weight is based upon a 26” wheel sized example of this bike. We weighed the complete bike as you would receive it.